We know that hedge funds generate strong, risk-adjusted returns over the long run, therefore imitating the picks that they are collectively bullish on can be a profitable strategy for retail investors. With billions of dollars in assets, smart money investors have to conduct complex analyses, spend many resources and use tools that are not always available for the general crowd. This doesn’t mean that they don’t have occasional colossal losses; they do (like Peltz’s recent General Electric losses). However, it is still a good idea to keep an eye on hedge fund activity. With this in mind, as the current round of 13F filings has just ended, let’s examine the smart money sentiment towards Coca-Cola FEMSA, S.A.B. de C.V. (NYSE:KOF). Coca-Cola FEMSA, S.A.B. de C.V. (NYSE:KOF) was in 6 hedge funds’ portfolios at the end of December. KOF investors should pay attention to a decrease in enthusiasm from smart money of late. 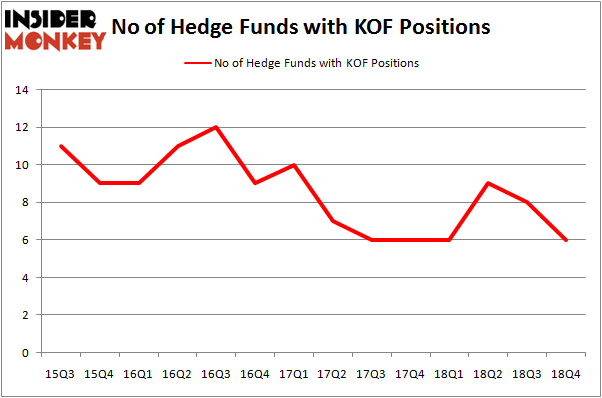 There were 8 hedge funds in our database with KOF holdings at the end of the previous quarter. Our calculations also showed that KOF isn’t among the 30 most popular stocks among hedge funds. According to most shareholders, hedge funds are assumed to be underperforming, old financial vehicles of yesteryear. While there are more than 8000 funds with their doors open at present, Our experts look at the bigwigs of this club, about 750 funds. These investment experts command the majority of all hedge funds’ total capital, and by tracking their best stock picks, Insider Monkey has unearthed several investment strategies that have historically outperformed the S&P 500 index. Insider Monkey’s flagship hedge fund strategy outstripped the S&P 500 index by nearly 5 percentage points per annum since its inception in May 2014 through early November 2018. We were able to generate large returns even by identifying short candidates. Our portfolio of short stocks lost 27.5% since February 2017 (through March 12th) even though the market was up nearly 25% during the same period. We just shared a list of 6 short targets in our latest quarterly update and they are already down an average of 6% in less than a month. Let’s take a look at the latest hedge fund action regarding Coca-Cola FEMSA, S.A.B. de C.V. (NYSE:KOF). Heading into the first quarter of 2019, a total of 6 of the hedge funds tracked by Insider Monkey were bullish on this stock, a change of -25% from the previous quarter. Below, you can check out the change in hedge fund sentiment towards KOF over the last 14 quarters. So, let’s examine which hedge funds were among the top holders of the stock and which hedge funds were making big moves. When looking at the institutional investors followed by Insider Monkey, Bill & Melinda Gates Foundation Trust, managed by Michael Larson, holds the largest position in Coca-Cola FEMSA, S.A.B. de C.V. (NYSE:KOF). Bill & Melinda Gates Foundation Trust has a $378.1 million position in the stock, comprising 1.7% of its 13F portfolio. Sitting at the No. 2 spot is Renaissance Technologies, led by Jim Simons, holding a $75.1 million position; the fund has 0.1% of its 13F portfolio invested in the stock. 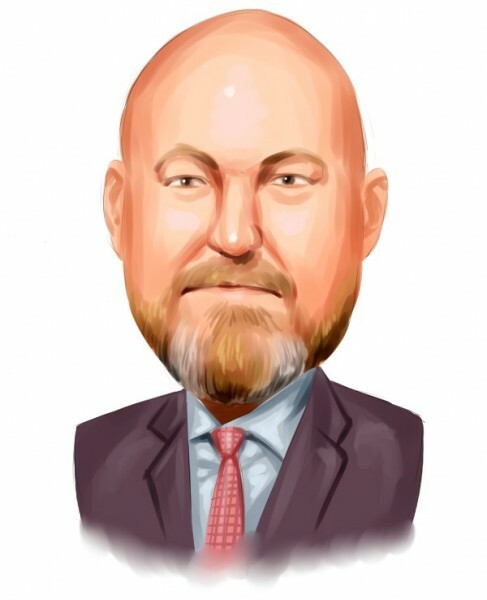 Some other professional money managers that hold long positions contain Israel Englander’s Millennium Management, John W. Moon’s Moon Capital and Cliff Asness’s AQR Capital Management. Judging by the fact that Coca-Cola FEMSA, S.A.B. de C.V. (NYSE:KOF) has witnessed declining sentiment from the smart money, we can see that there were a few hedge funds that elected to cut their entire stakes in the third quarter. Interestingly, Ken Griffin’s Citadel Investment Group said goodbye to the biggest investment of the “upper crust” of funds followed by Insider Monkey, valued at close to $0.7 million in stock. Mike Vranos’s fund, Ellington, also dumped its stock, about $0.3 million worth. These bearish behaviors are interesting, as aggregate hedge fund interest dropped by 2 funds in the third quarter. Let’s check out hedge fund activity in other stocks similar to Coca-Cola FEMSA, S.A.B. de C.V. (NYSE:KOF). These stocks are Laboratory Corp. of America Holdings (NYSE:LH), Yum China Holdings, Inc. (NYSE:YUMC), Huntington Bancshares Incorporated (NASDAQ:HBAN), and Cincinnati Financial Corporation (NASDAQ:CINF). This group of stocks’ market values are similar to KOF’s market value. As you can see these stocks had an average of 28.5 hedge funds with bullish positions and the average amount invested in these stocks was $507 million. That figure was $477 million in KOF’s case. Laboratory Corp. of America Holdings (NYSE:LH) is the most popular stock in this table. On the other hand Cincinnati Financial Corporation (NASDAQ:CINF) is the least popular one with only 22 bullish hedge fund positions. Compared to these stocks Coca-Cola FEMSA, S.A.B. de C.V. (NYSE:KOF) is even less popular than CINF. Considering that hedge funds aren’t fond of this stock in relation to other companies analyzed in this article, it may be a good idea to analyze it in detail and understand why the smart money isn’t behind this stock. This isn’t necessarily bad news. Although it is possible that hedge funds may think the stock is overpriced and view the stock as a short candidate, they may not be very familiar with the bullish thesis. In either case more research is warranted. Our calculations showed that top 15 most popular stocks among hedge funds returned 19.7% through March 15th and outperformed the S&P 500 ETF (SPY) by 6.6 percentage points. Unfortunately KOF wasn’t in this group. Hedge funds that bet on KOF were disappointed as the stock returned 2.1% and underperformed the market. If you are interested in investing in large cap stocks, you should check out the top 15 hedge fund stocks as 13 of these outperformed the market.